• 1 year post-season ban*. • 9 scholarships lost over 3 years. • Vacate entire 2010 season, including the Sugar Bowl. • Repay $338,000 for 2010 B1G bowl payout. • 5-year "show-cause" for Jim Tressel. Seems like a lot, but they deserved more. A lot more. More scholarships lost, at least. Probably another year of a bowl ban. And Gene Smith should be shown the door. And let's not forget, it's because of all of this that Urban Meyer is now Ohio's new coach. I don't think this will change anything. * Post-season ban includes the B1G Championship game. So should Ohio finish the season and qualify for the title game, their spot would fall to the second-place team in the Leaders Division. Wisconsin fans should be very happy about this. Totally agree! They deserved A LOT more sanctions ... THIS YEAR! And what does probation mean? Let's watch and see if Urban suddenly gets sick again! Urban Meyer was lucky to have Tim Tebow. Once Tim graduated, Florida nose-dived, Meyer got sick and retired. He's not a magician, and NOT better than Hoke. As a graduate of Ohio I who has always hated Ohio State this article is slander. Ohio is not on probation. Ohio STATE is on probation. Look, I understand the rivalry. However, this is totally different from something like Woody Hayes referring to Michigan as "That school up North." If Michigan wants to use the term "That school down South" or "That school in Ohio" then fine. If, for some reason UM has a problem with OU, and well and wants to refer to OU in disrespectful terms as well then fine. But as it is it is a case of intentional mistaken identity. Its the same as someone writing an article on the atrocities of Adolf Hitler and in each instance referring to Hitler as "Brady Hoke." Saying that the author has always referred to Adolf Hitler as "Brady Hoke" wouldn't justify it. My blog, my rules. If I want to call them "Ohio", I can. If I want to call them "fantastic gobstoppers", I can. 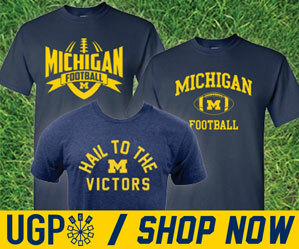 I respect Michigan, the academics of the University and its athletic programs. My cousin mark was recently your football teams starting center. I don't want to blow this out of proportion. I'm not going to sue you or anything like that. I'm respectfully asking that you treat the University where I received my undergraduate degree with more respect that that. Yes, you can call them fantastic gobstoppers if you want. But the statement "Bowl Ban for Ohio" is a defamatory falsehood resulting from negligence on the part of the publisher so it fits every definition of libel and by law you actually CAN'T do that. Come on. I can do that. And know full well that I can. Take your Buckeye crazy someplace else. Has Ohio been placed on Probation? No. Ohio University is one of only a few dozen Division 1 schools that never has had a major infraction in any sport. Do you think that it would be right to right up an article about Ohio State's infractions titled "Michigan receives Bowl Ban"? I see that you have not corrected what you now must certainly know is a fictitious article. It reflects very poorly on your site that you are willing to leave derogatory falsehoods.